We need to stay hydrated. And what better way than to use the Alkal-Life Water Ionizer! This water system easily connects to the faucet and uses the world’s most advanced pH calibration system to turn tap water into alkalized water. Acidic build-up in our bodies is common from pollution, stress, and diets rich in dairy, animal protein and processed foods. 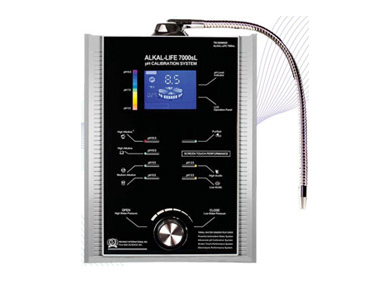 The purpose of the Alkal-Life Water Ionizer is to bring alkaline water to our bodies, which helps restore our ideal pH balance (6.9-7.2). Consequently, this alkalized water allows for better hydration – the cells/body can absorb this water faster and easier. Also, nutrient absorption is improved for increased energy and improved vitality. Complete with a one-year limited warranty, the Alkal-Life Water Ionizer retails for $2,000.